After the clay has been prepared and is ready for throwing, the next step is to center it on the potter's wheel. Some potters work directly on the wheelhead, but most use a bat. For small amounts of clay, you can simply smack the ball or cone of clay onto the bat, coming as close to the center point as possible. Smacking the clay down with some force helps it attach to the throwing surface. Be careful not to have any of your fingers in the way. For large amounts, after smacking the clay down you may want to pat the clay into the middle before wetting it and beginning to center. To do this, use both hands in opposition to each other with the clay in the middle. As you center, remember that success during the throwing rests on successfully centering the clay. Centering clay on the potter's wheel requires speed and lubrication. Begin by dousing the clay with a handful of water or slurry. Never let the clay begin to dry; it will catch on your hands and go off center. The wheel should be rotating at full speed as your center. When you feel no more movement under your hand and your hand no longer moves at all as it rests on the top and sides of the clay as the clay rotates at full speed, the clay is centered. If you are throwing a very wide, low form such as a plate, platter, or low bowl, you should center your clay into a low dome. If you are throwing a pot that is relatively equal in terms of height to the width at the base, you will want to center the clay into an average dome shape. If you are throwing a very tall form, shape the clay into a taller, narrower dome. Keep in mind, however, your fingers will still need to reach all the way down to the level of the pot's future floor as you open the form. If you will be throwing off the mound, don't worry about centering the base of the mound. Only center the clay at the top in the area you will be throwing. It is helpful to undercut that volume of clay as you center it, being careful not to undercut it too much. If you do so, the clay will simply twist off the mound. There are different styles that potters use to center the clay. One method is to pull the clay toward you. 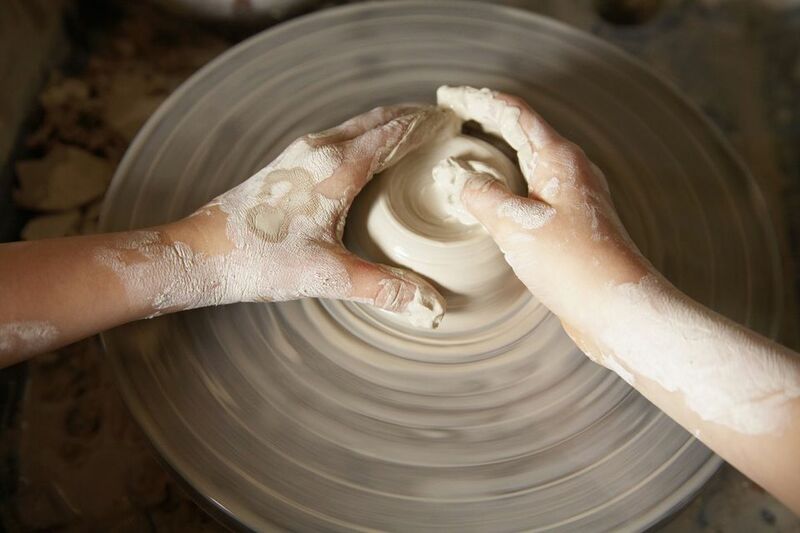 By exerting firm pressure on both hands as you pull, you will force the clay into the middle. Use your fingers to control the sides of the clay and your thumbs to control the top of the clay as you push it into a dome shape. This method is best suited for small amounts of clay, from about one to three pounds. Another method of centering clay is to push it. 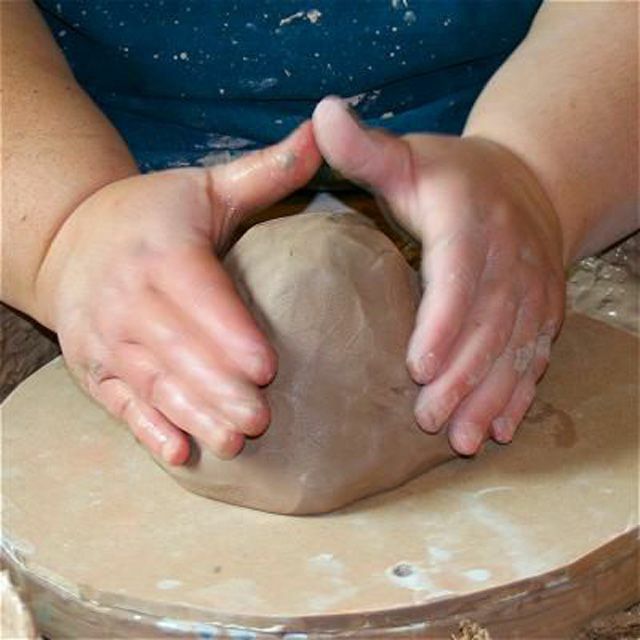 To do this, place your hands on either side of the clay as it rotates and push in toward the center. Again, this method works best with smaller amounts of clay, about three pounds of clay or less. Be certain to control the top of the clay with your thumbs. Use the lower edge of your palm to ensure the very base of the dome is also centered. When working with larger amounts of clay, the best method of centering is to use the heel of the palm of one hand, and either the flat or fist of your other hand. This method also works well with small amounts of clay. To center this way, brace your elbow against your hip or thigh. Position the heel of the palm of that hand so that there is a straight line from your elbow to the center of the wheel. The heel of your palm will force the clay inward. Use the side of your other hand (or your fist) to force the top of the dome down and into the center. One of the other advantages of this method is that you can carry a loaded sponge in your upper hand. As you center and the clay dries, you can easily lubricate it by squeezing the sponge slightly without having to move your hand to scoop water or slurry from your bucket. While the clay is being centered, many potters include a step called wheel wedging. Wheel wedging is mainly done to align the clay's platelets so that throwing is easier. It also can be used to introduce a bit more water into a stiff clay or to help make certain that the clay is fully homogenized. To wheel wedge, center the clay into a dome. Push into the middle, forcing the dome upward into a unicorn horn shape, controlling it with both hands. Once you have it nice and tall, bring it back down, controlling it so that the clay does not fold over itself, but swells from the inside outwards. Reform the centered dome. To make sure the clay is homogeneous and to align the particles, we'd suggest at least three cycles of this.